Africa’s Infrastructure: A Time for Transformation , the inaugural report in the Africa Development Forum series  in 2010, was the fruit of an unusual confluence of circumstances. Seldom have donors put such a solid funding base behind primary data collection and analytical work on infrastructure, seldom has World Bank management been able to dedicate such significant human resources over a multiyear horizon to study these issues, and seldom has an infrastructure knowledge project brought together such a broad coalition of stakeholders including the key regional bodies in Africa. The catalyst was the high level of political commitment on African infrastructure made at the G8 Gleneagles Summit in 2005 based on the background work conducted for the Blair Commission Report on Africa. 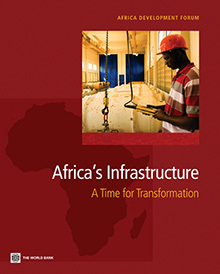 A highlight of the project was when the main messages of the book—such as, Africa’s infrastructure services are twice as expensive as elsewhere; poor infrastructure cuts growth rates by 2% every year and reduces business productivity by 40%; and regional integration holds the key to reduction infrastructure costs—were conveyed to all African Heads of State at the 2009 African Union Summit through a five-minute video presentation  that was beamed simultaneously on a jumbo-size screen to the public in the main square of Addis Ababa. That rousing and succinct distillation of the book remains available on YouTube. The book, Africa’s Infrastructure: A Time for Transformation, draws upon a large body of output and led to additional reports on four African infrastructure sectors—ICT,  Power , Transport , and Water —as well as 15 background papers, 21 working papers, 28 country reports, 5 subregional reports, an on-line database exceeding 1,000 indicators, and an infrastructure atlas for most countries on the continent; all of which is available through the project website: www.infrastructureafrica.org . What is the impact of all this analytical work? The book contributed to raising the profile of Africa’s infrastructure challenge in a way that has helped to sustain increased financial flows; it drew particular attention to the plight of the energy sector that had not been fully appreciated. A recent Brookings study  notes, “Overall financing for infrastructure in Sub-Saharan Africa across the three major external sources has tripled between 2004 and 2012 with few, if any, lingering signs of receding investments during the worldwide recession…. The energy sector has had the fastest growth across all external financing sources since 2009: It now attracts 45% of the total external finance.” Africa’s Infrastructure: A Time for Transformation also fed directly into the design of the African Union’s Program for Infrastructure Development in Africa—the continental blueprint for regional integration through to 2040. While there have been follow-on efforts, none are a full update. The African Development Bank took on the challenge of sustaining the project’s data collection effort over time. Moreover, a number of players have undertaken targeted updates on specific topics, including a recent report on financing trends from Brookings  and forthcoming studies on independent power projects, utility privatization, and regional power trade from the World Bank’s Energy and Extractives Global Practice.